A frozen dessert is not the obvious choice to end a dinner served in January. Living in the moderate climate of Southern California had something to do with it, but the main reason was trying to find a lighter finish to a rather heavy meal and I think this was the perfect end to our dinner. For me at least. You can ask my dinner guests for their opinion. We paired the tartness of the sorbet with raspberries and blackberries and to add a hint of sophistication, thyme sprigs are steeped with the lemon zest and sugar before the sorbet is frozen. The herb flavor is very light and I will steep more sprigs the next time I make this dish. If you're up for it, go heavy on the thyme. For a moment I considered leaving thyme leaves in the mixture to complement the beautiful flecks of yellow you get from the lemon zest, but ultimately decided against it. Let me know if you go for it. I'd love to know how it tastes! Mix water and sugar together and bring to a simmer with the thyme sprigs. While the water and sugar mixture is warming, zest two lemons and add the zest to the pot. Simmer very gently until the thyme is fragrant. Chill mixture thoroughly (with the thyme sprigs still in the mixture). Juice enough lemons to get one cup of lemon juice (about six lemons depending on size). Add the lemon juice to the chilled syrup, remove the thyme sprigs and freeze according to your ice cream makers instructions. Boy does this make me wish I had an ice cream maker! That looks like the perfect refreshing way to end a meal. I don't think there's anything wrong with sorbet in January (but this is from a girl, who every year in college in upstate NY went out for ice cream with her friends to celebrate the first snow). The lemon thyme combo sounds wonderful. mmm I need an ice cream maker, pronto! 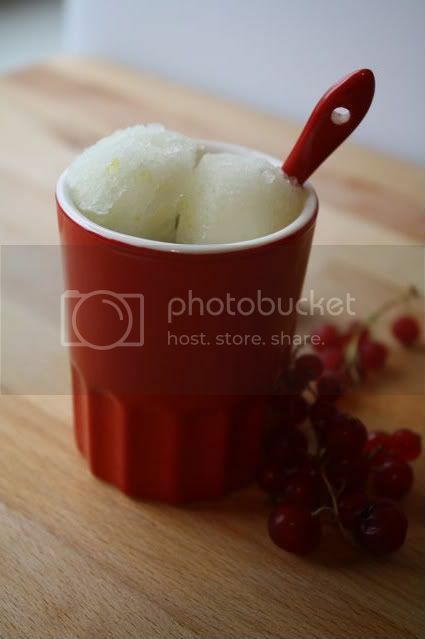 Lemon Sorbet is one of my favorites! I like the Thyme addition! Sounds wonderful! Yum! A lovely combination of flavors! This sounds refreshing and divine...and a great way to use that container of thyme thats been sitting in my fridge for a week. Gosh, I've never tried a lemon thyme sorbet. Sounds wonderful! yum -- what a delicious, simple recipe! sounds great. What a great dessert! And sorbet is perfect for January here in Sydney - we are sweltering in the summer sun! Maybe I should travel down south to check out the warmer weather! Its definitely cold here in northern california. I made a granita like this but I used basil. I definitely want to try it with the thyme now, it sounds wonderful. Oh wow! That looks amazing! Great choice (and I love the cup you served it in). I LOVE that photograph! Very well done! What a great flavor combo. I bet this was delicious!